Located on BC Highway 97 in the south Okanagan Valley, only five minutes from the Canada - US border, Osoyoos, British Columbia, basks in Canada's driest climate. A fact not lost on sun loving vacationers and retirees! In fact, Osoyoos is located on Canada's only desert - the northern most tip of the Sonora Desert. Situated in the heart of the South Okanagan, and boasting the lowest annual rainfall and the highest average temperatures, this is appropriately called BC's Desert Wine Country! Once a crossroads for north-south, east west trade traffic, Osoyoos is now primarily a retirement & vacation center and orchardist area. Apricots, peaches, pears, plums, cherries, apples and grapes thrive in the hot, dry climate, while the surrounding area features desert flora and fauna such as prickly pear cactus, antelope bush and rare species of birds. Visit Canada's warmest lake - Lake Osoyoos - for a wide array of watersports or enjoy many of the festivals and jamborees hosted here. Fish in nearby lakes, hike the hills or golf one of the local links. 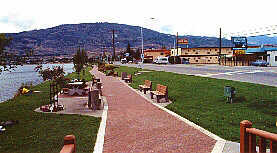 Lodging, accommodation, restaurants, pubs, shops and services are located in Osoyoos. Oyoyoos is a British Columbia First Nations word meaning "The Narrows of the Lake". Accommodations: The entire Osoyoos area has a variety of accommodations for the visitor from camping facilities in private sites and provincial parks to numerous value motels and destination hotels plus unique lodges and bed & breakfasts. 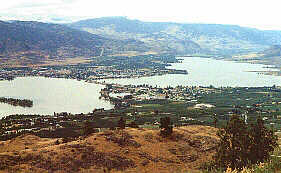 There are a number of small to mid-size communities along Highway 97 from Osoyoos to Penticton. The entire area is renowned for its many recreational activities and fascinating sites; there are plentiful orchards full of delectable fruit all summer long plus numerous lakes and rivers for camping and fishing and relaxing as well as a number of visitor services and attractions. Okanagan Falls is surrounded by orchards, ranches and vineyards. The visitor can explore the many well-preserved heritage buildings, and tour fine wineries and the several fruit confection facilities. The community of Kaleden is located on Skaha Lake and provides visitors with various resort facilities, beach access, restaurant service and gas. Fruit stands, a game farm, Christie Memorial Provincial Park and a tourist information centre are nearby. Location: Kaleden is located on Highway 97, approximately 10 minutes south of Penticton. Oliver is located between Osoyoos and Skaha Lakes on Highway 97 in a lush fruit growing area.